Voss Helmets are made from a unique blend of composite that creates an ultra lightweight helmet without sacrificing durability. Deluxe lined interior offers amazing rider comfort. Fully adjustable Y-strap retention system and quick release for ease of use. Finally a helmet that is everything you wish your other helmets could have been. Our customer always comes first, and we constantly strive to exceed your expectations! Our goal is that you're sure to find exactly what you're looking for. "WHERE OUR WORD IS OUR BOND"
It's like a cheap insurance policy that you get a return on your investment in few days. Trackimo allows you to track anything, anyone, anytime anywhere in the world. 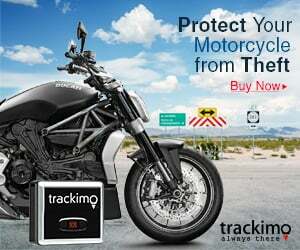 Trackimo GPS Tracker is a tracking solution for your motorcycle that improves motorbike security, reduce insurance premiums and offer you peace of mind that in the event of a theft, the police will be able to find your bike. A tiny device that features real-time worldwide tracking of your bike, viewable on smart phone app or desktop 24/7. Movement alarm - Be notified the very second your bike is moved without authorization through SMS or email. For those who are crazy about hunting, hiking, mountain biking and other outdoor activities & sports, Trackimo lets them plan, record and re-trace their tracks. Increases chances of delivering items right on schedule - gives you a way to detect possible delays and notify your customer on the estimated time of arrival. in the world with advanced side deflecting dual front wheels, the iTank has been awarded 17 patents for it's structural features that enhance it's stability on any road surface. see it, please send us an email we may have it. or cracked face shield or mechanism. ENJOY YOUR SUMMER AND AS ALWAYS "RIDE SAFE OUT THERE"
International & may incur higher shipping rates. VIVS VOSS internal visor system is our built in drop down eye shade that can be removed or replaced in seconds without tools. and a installed Clear visor. to the very best of our ability. 1. Fit cloth tape measure snugly around widest part of head approximately 1" above the eyebrow, just above the ears and at the point on the back of your head that will give you the largest measurement for your motorcycle helmet size (see illustration). 2. Find your head size in the correct chart above, then order the corresponding helmet size per the motorcycle helmet product sizing. 3. Safety dictates that if your head size falls between two of the motorcycle helmet head size ranges listed, order the smaller motorcycle helmet size as a motorcycle helmet must fit snugly. 4. If you don't have a tape measure, you can use a piece of string. Wrap the string around your forehead about where you want the helmet liner to rest. Then use a ruler or yard stick to. the voice and eliminates background noise, so users can be heard even in the most extreme environments. THE VOSS HEADWEAR ON THIS PAGE HAS BEEN DESIGNED FOR NOVELTY PURPOSES ONLY. AN UNEXPECTED ACCIDENT, DEATH ETC. WEAR OR USE AT YOUR OWN RISK!. impacted motorcycling "Paving the Way" for more beautiful women riders. Welcome to the New Age of Electric Transportation! and may safety & good judgment chase you while on the road! "This site is not affiliated with, maintained by, or in any way officially connected with Voss Genuine Head Ware or KYL Industrial Co.
Taiwan, the manufacturer. All Voss images and some photographs, presented within this site are copyright from Voss Genuine Head Ware. VossNovelty-DOThelmets.com is owned and operated by GekGo Worldwide."